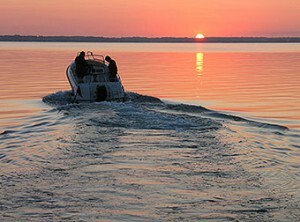 Crestliner boats are built with unmatched dedication to style, performance, durability and comfort. They are backed by 70 years of manufacturing expertise and made to pass down from generation to generation. Its no wonder that you love your Crestliner boat so much and want only the most experienced boat repair technicians to touch it. Anchor Marine Repair is just as passionate about Crestliner boats as you are. We excel at aluminum boat repairs and offer very convenient Boat Pick Up and Drop Off Services to our customers in the Minneapolis and St. Paul, MN surrounding areas. Aluminum boats are very complex systems and Crestliner boats are no exception. Though they are built right, they are not immune to damages when boaters play hard and hit rough waters. It is possible for your boat to develop leaks around the rivets from contact with rocks or a sharp object. Finding the source of the leak can be difficult. The best way to ensure a durable repair is to take your boat to Anchor Marine Repair where we are highly experienced in Crestliner Aluminum Boat repairs. If your boat has been damaged due to a storm or collision, the experienced boat repair technicians at Anchor Marine Repair are here to make it right again. We understand the Crestliner’s Four-X Hull, Interlocking Tongue and Groove Panel Construction and Refined Finish. Our state-of-the-art facility is well equipped with the latest technologies and is staffed with skilled technicians who are experienced in aluminum boat repairs. Take advantage of our boat pick up and drop off services within a 250-mile radius of Minneapolis, MN. Anchor Marine Repair uses the latest in Technology and Techniques to restore your beloved Crestliner boat. Our Experienced Boat Repair Technicians will have it looking the absolute best it can look. We have the right skills, experience, tools and attitude to take care of your prized boat at surprisingly affordable prices. Trust us to handle all of your aluminum boat repairs and renovations.